About the only survival skills kids seem to have these days is how fast they can text on their phones, so why not broaden their horizons and send them to PREP School this Summer? There are dozens of survival skills for kids and summertime is the perfect time to learn them. 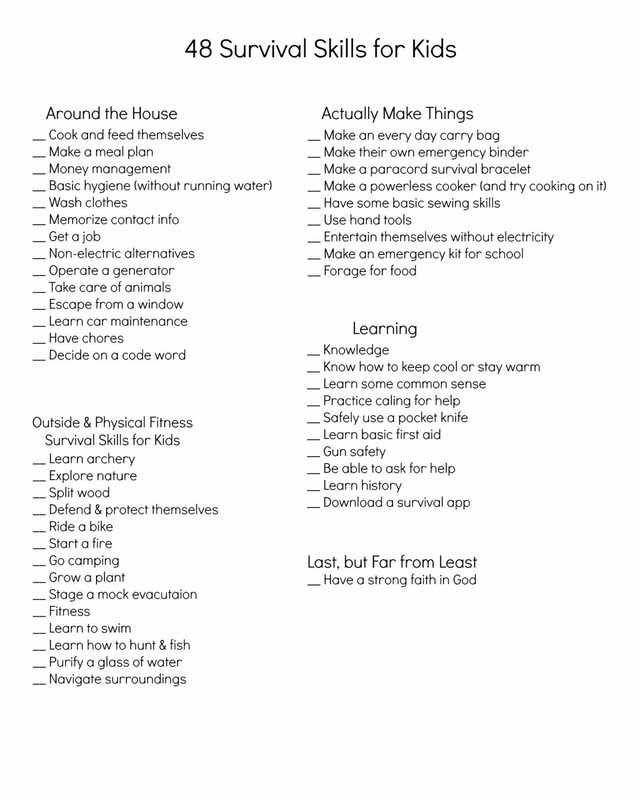 As tempting as it might be to have the I-Pad babysit your kids, why don’t you print off the list below and have them learn some Survival Skills? If they learn and cross off 4 skills a week during the 12 weeks they are off from school, they will complete the entire list before school starts back up. You can even give incentives for each one they master and hold your own graduation at the end! 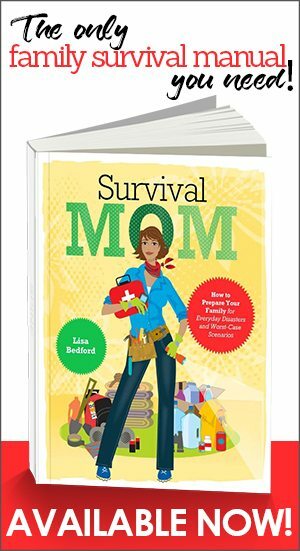 Some of these survival skills you might think your child isn’t ready for (which may be true), but you also might not be giving your child enough credit. My 5 year old can do each of these to some extent. So depending on how old your child, is you can make these more or less challenging. Plus, who knows? You might learn a few new skills yourself! Some of these 48 Survival Skills Kids Can Learn are around-the-house skills, others are knowledge, and still others are actually making things. You can download the list here. Cook and Feed Themselves – Depending on your child’s age, they should be able to cook a basic meal using ingredients from the pantry. Find opportunities to have your kids in the kitchen cooking with you! They can help stir, dump ingredients in a mixing bowl, and find the correct measuring spoon. Money Management – Too bad most adults don’t know anything about this skill – some still use their parents as a personal ATM. If your kids learn this skill while they are young, just imagine the impact on the rest of their lives (and yours)! Basic Hygiene (w/o running water) – If you really want to put survival to the test, turn off the water and find other ways to brush your teeth, take a shower, or even go potty. Wash Clothes – Bonus points if they do it by hand on a washboard, but every kid should at least learn how to spot their clothes, wash, dry, hang-up, and the hardest part, put them back in their closets and drawers! Memorize Contact Info – Do your kids know their address, phone number, parent’s name, or even their last name? This is something they need to know, because you never know when your family might become separated. If they are too young to learn them, consider putting contact info on a bracelet or necklace they can wear. Get a Job – Nothing teaches kids a work ethic and responsibility faster then getting their own job. They don’t have to drive or be 16 for this survival skill either. They can mow lawns, pet sit, babysit, do odd jobs for neighbors, or even work for Mom or Dad. 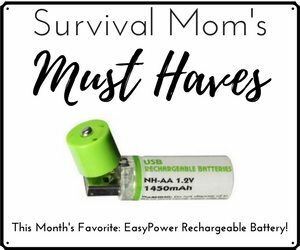 Non-Electric Alternatives – I never realized how practically EVERYTHING I use requires electricity in some form until the power went out for 3 days in our area. Make a list of all the things you use on daily a basis that require electricity and find an alternative for each. Make a game out of it and have a No-Electricity Day and see if you have major withdrawals. Operate a Generator – If you have a generator, have the kids learn how to properly care for and operate it. It’s good to make sure it’s working properly BEFORE you need it. Escape From a Window – Maybe this isn’t exactly a skill you want your kids to master, but it’s an important fire safety skill. They should know how to escape safely and without breaking any bones, especially from a 2nd story window. Be sure to add a couple of practice sessions for something this important. Learn Car Maintenance – It doesn’t matter if your kid is driving yet. I hand mine the mini vacuum and make them clean all the snacks they crush into the seats. You don’t have to be a mechanic to help your child learn how to check the tire pressure and put air in them, check the oil, or even how to ask for help in AutoZone. In the long run, properly maintained vehicles save you money, and doing it yourself saves even more. Have Chores – Just like mom and dad have jobs, kids need to have some everyday responsibility within the family. Moms shouldn’t be the maid (I tell mine that on a daily basis). Kids can help pull their weight by doing dishes, taking care of the lawn, picking-up their rooms, and so much more. Don’t take away the sense of accomplishment your kids will get from having chores. Decide on a Code Word – Does your family have a code word for – “please help now” or “someone is threatening me but I can’t say anything with them standing right here?” If not, take some time to come up with a code word, or a even a few with different meanings in case you ever find yourself in a sticky situation! Learn Archery – I didn’t realize at what a young age kids could pick up archery, but our kids recently got bows and are already better than I am (which doesn’t say much). They enjoy it and it’s a skill that could really come in handy if you’re ever abandoned in the woods. Explore Nature – It’s embarrassing to admit, but some days we don’t step outside once. Kids can’t learn about their surroundings if they never have a chance to explore them. If you need ideas on exploring nature take a loot at these 31 Ways to Help Your Child Get Outdoors! Split Wood – If you need a fire to cook food or to help you stay warm, you’re going to need some wood! Learn how to split wood properly before the kids sneak an ax and try doing it themselves. Defend & Protect Themselves – I have small kids and I constantly worry about them getting picked-on at school, so teaching them when and how they can protect themselves is a must. Find a self-defense class, sign them up for karate or another martial art, or discuss with them what they should do if caught in a bad situation. 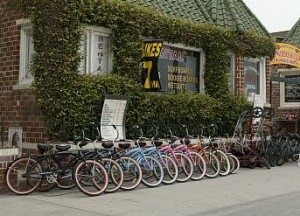 Ride a Bike – Take some opportunities to help your child learn to ride a bike if they haven’t already. Take them to an open parking lot, work on pedaling, or even get a fun glider bike if they need help learning how to balance. Not only is this great exercise, but it helps your kids realize there are other ways to get around without Mom’s taxi service! Start a Fire – Knowing how to start a fire is a must in any survival handbook. Go ahead and teach your kids the proper ways to start fires before they attempt to do this unsupervised in your back yard (like mine)! 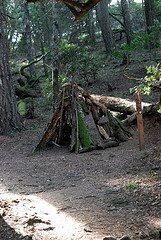 Go Camping – Even if you just go camping in your backyard, their are numerous survival skills you can learn. Camping requires you to have food, ways of cooking it, somewhere to sleep, and so much more. It’s a great way to practice and see how ready you really are. Grow a Plant – Last year we planted a watermelon seed my child brought back from school and I was a little surprised how well it actually grew. The day we were able to eat the watermelon he had taken care of was priceless. Since then our children have gotten more into gardening and they take so much pride in growing and eating their own food. Stage a Mock Evacuation – What is a real threat in your area? Tornados, fires, hurricanes, floods, or something else? Go ahead and stage a mock evacuation where your family has to get ready to leave in a hurry! You might learn a lot about your family and what they value. Fitness – Being fit is much more than looking good, it’s having the endurance to walk or hike long distances. Try planning a hike for your child while they carry their own bug out bag or emergency kit. 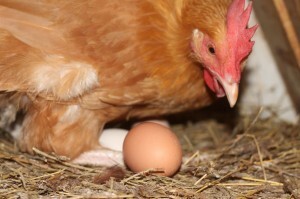 This is good training to see how much they can handle, or if you need to lighten their load. Learn to Swim – With swimming season approaching water safety is a must! The best way to feel comfortable around or near water is to learn how to swim. There are even classes for babies that will help them know how to float on their backs until help arrives, and once your child is old enough, sign him or her up for swim team. Help your child be a strong swimmer. This is a skill they will use their entire life. Know How to Hunt & Fish – Being able to get your own meat by hunting or fishing is one of the ultimate survival skills. Sometimes it’s difficult to find places to hunt, but you can usually find a lake or pond nearby to at least go fish. Give your child some opportunities and help them process the meat afterwards. Purify a Glass of Water – Do you have any filters and purifiers? Have you ever put them to the test? Try actually getting water from a different source other than the home faucet and see if you can properly filter and purify a glass of water. Navigate Surroundings – We are so accustomed to just asking our phone to navigate us where we want to go, does your child even know how to use a map? Better yet, do you even own a map of your area? It might come in handy when power is down and you need to get around. If you’re really fancy, practice using a compass or even the stars to navigate. Make an Every Day Carry (EDC) Bag – EDC bags aren’t just for adults. Kids can fill their pockets or carry a bag with important essentials too. If you need ideas for putting one together, you can find tips for creating one here. Make Their Own Emergency Binder – Kids are never too young to start preparing for the future and make their own grown-up Grab-n-Go Binder! They can start filling it with recipes they enjoy, survival skills they are learning (or want to learn), important documentation and more. Make a Paracord Survival Bracelet – Having 8-10 feet of colorful paracord with you at all times could really come in handy, especially in a survival situation. Go ahead and help your child make their own Paracord Survival Bracelet this Summer as well as other paracord projects. Make a Powerless Cooker (& try cooking on it) – Help teach your kids there are other ways to cook your food besides the microwave by making an alternative cooking method. They get bonus points if they actually make a meal with it afterwards! Have Basic Sewing Skills – How about learning some basic sewing skills so if your child ever had to make their own poo wipes or needed a wonder oven they could sew it? Sewing skills come in handy for much more then mending clothes. Use Hand Tools – Does your child know how to use any of the countless tools lying around in the garage, or even better do you? How about dusting them off, or getting them their own small set of tools? They can learn how to do basic repairs, hang pictures on their wall, or if they really want a challenge, they can build their own bow! Entertain Themselves without Electricity – I’m not sure if they have labeled a disease yet for kids who are addicted to iPads, phones, TV, & electronics, but about 90% of kids I know seem to suffer from it. Challenge your children to learn how to play a game (or more) that requires NO Electricity! Make an Emergency Kit for School – When summer vacation is almost over, you might want to consider making an emergency survival kit for school. Depending on where you live, your child might be stuck at school during a snowstorm, tornado, or another situation where it might come in handy. Forage for Food – This is something I want to learn how to do! Maybe doing it with my kids will give me a chance to finally learn about the different edible (and not so edible) foods in our area. If your kids know how to forage for food you can literally send them out to the backyard for dinner! Knowledge – This is one skill that takes time, but it’s also something you don’t have to worry about losing or getting stolen. Check-out books on survival topics your child is interested in at the library. Know How to Keep Cool or Stay Warm – Depending on where you live and the season, these survival skills can be the difference between life and death. We had to do an ER visit last year when my sister got severe heat stroke, and I’ve had friends almost lose finger and toes from not keeping them dry in freezing temperatures. Learn Some Common Sense – Basic common sense seems to be diminishing with each generation, but it doesn’t mean your child has to suffer from the disease too! Raising competent kids in today’s world can be a true challenge when they are being spoon-fed constantly, but there is hope. Take an honest look at your children and see if there are areas where you can help prepare them for real-life. Practice Calling for Help – What if you were in trouble and the only one that could help is your toddler? Would they know how to call 911, ask someone for help, or go to a neighbor? Go ahead and practice different situations or scenarios to see if they could help, if they had to. Safely Use a Pocket Knife – Little boys (and big ones too) are just drawn to anything that is dangerous and could possible harm them, so why not go ahead and teach them how to safely use and maintain their own pocket knife? This way, they won’t secretly steal and stash your kitchen knives! Learn Basic First Aid – I have to be CPR certified & have basic first aid knowledge for my job, but these are skills that kids can learn too. 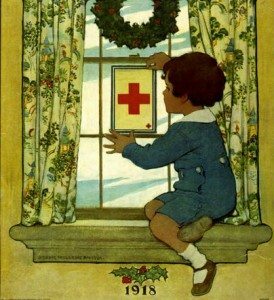 Once they get down how to put a Band-Aid on, consider signing your kids up for a first aid class or similar age-appropriate class. Older kids can even train as EMTs and ask to volunteer with the fire department. Gun Safety – Even if you do not now and will never own a gun, kids need to know what to do if they are ever in a situation where there is one. My friends and family have had incidents because kids didn’t know how to properly handle firearms! So whatever you do – at least teach them to not touch, never point them at anyone, and never put your finger on the trigger! 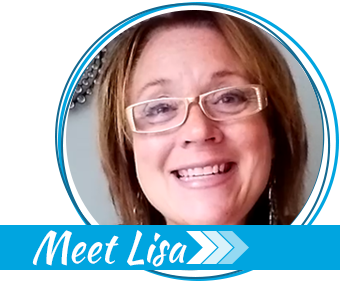 Be Able to Ask for Help – I never realized what a true survival skill this was until recently when I applied my child to a special needs school. The director said they know when a child is ready to leave their school when they can ask for help on their own. Do your children know how (or even who) to ask for help…or do you always do it for them? Do they even place their own order at a restaurant? Learn History – It’s hard to prepare for the future if you haven’t learned from the past. Have your child hit the library (or even appropriate websites), visit National Parks, talk to older people (grandparents perhaps)…. There are lots of ways to give kids an opportunity to learn to enjoy real history! Download a Survival App – I had to throw in at least one thing kids could do with their phones and tablets. Not all disasters will mean you’re losing cell coverage, so downloading emergency apps for your child could really make a difference. Have a strong faith in God/appreciation for spiritual things – Whether or not your own family is religious, kids should be taught about faith — what it is and how it’s important in their lives. As a Christian, our children have learned that there is a presence and a power greater than themselves. We all reach a point in life when our own strength, knowledge, and self-confidence reach an end. Kids need to know — what do I do when that happens? In our case, we’ve taught our kids to pray and they’ve learned Bible verses that teach the power of prayer and the power of belief and faith. One book they have read is Case for Faith by Lee Strobel. Want to print out this list to keep track of your kids’ skills? Click here! So Will Your Child be Attending PREP School? 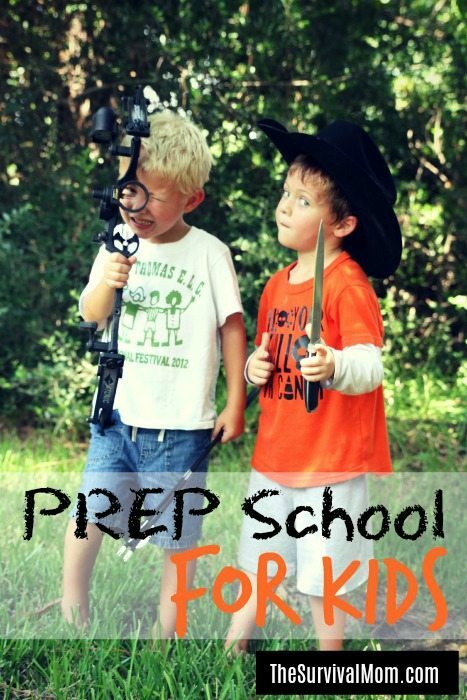 Let me know if your child participates in PREP school this Summer and what survival skills you plan on teaching them. 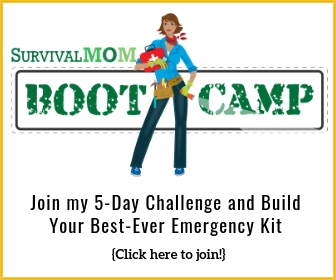 I would love to hear what they learn or if there are any other survival skills I should add to my list! Guest post by Jamie Smith. Updated by Lisa Bedford. Great Ideas! I will work on these with my 7 year old this summer. Also – if appropriate – basic needs for younger siblings. I never dumped baby care on the older ones as a regular practice, but helping with diapers or a baby/toddler meal was a real benefit if something was going crazy. No one else could breastfeed but there were definitely some times when an extra set of hands was very helpful. Even just how to hold or walk a baby – depending on the other child’s age. I would never let my 7 year old pull jars out of a pressure canner, but he could distract a hungry infant for a few minutes while I finished the green beans. So life gives us green beans right now, but truly preparing is using life to be ready for whatever may come. Well, actually I don’t remember how old my children were when they helped me can, but I’m pretty sure it was a bit over 7. The first born (the one we remember best and have completed baby book for) was (and is) quite a phenomenal child. If you’ve ever known an engineer you will understand what I’m talking about. But if you’ve been doing your motherhood preparation you know what your children can safely tackle. Hopefully, I can follow my own advice and work on these with my kids too! Tell them good luck! Would love to hear how it goes! I love it Gale! We are all “young at heart”. A lot of these skills I want to learn myself! +1 on your final point. I don’t really consider faith in God, going to church, Christian school, or family worship to be “prepping.” However, faith is the mist important thing I can pass down to them. Without that, prepping is worthless. What does it profit a man if he gains the whole world and loses his own soul? I have been creating ‘The 12 Months Before Christmas’ monthly packages for my children these last 5 months (72 hour Bug Out Bucket items) and I think June will be this article with incentives as to how many items completed for my grandchildren and great nieces & nephews. What a brilliant idea Marilee! Can I adopt you as my kids grandma? Can’t wait to hear how they do! +1 to your comment Shane! Prepping is definitely associated more with physical prep, but for me I feel spiritual prep plays a huge role too. I agree with what you said, everything you do in this life doesn’t matter if you lose focus on what’s really important. Thanks for taking time to comment.